United Air Lines Trip One was a scheduled transcontinental flight that originated in Newark, New Jersey. After making several stops, the flight landed in Cheyenne, Wyoming at which point the aircraft were swapped. Flying the remainder of the flight to Salt Lake City would be Douglas DC3A (NC16074). It was 6:26 PM on October 17th when Trip One departed Cheyenne with 16 passengers and a crew of 3. The weather en-route consisted of low overcast conditions with rain and snow flurries in the higher elevations. The weather was not a concern for Captain Earl D. Woodgerd who was a veteran flier with 11,000 hours of flight time and three years of experience flying the Cheyenne to Salt Lake City route. Assisting Woodgerd was Co-Pilot John B. Adams with 3,500 hours of flight time. A third member of the crew was Miss Leah Derr who served as the flight's Stewardess. In spite of the bad weather, a correction was made on the flight plan changing the previous entry of "instruments" to "intermittent instruments". 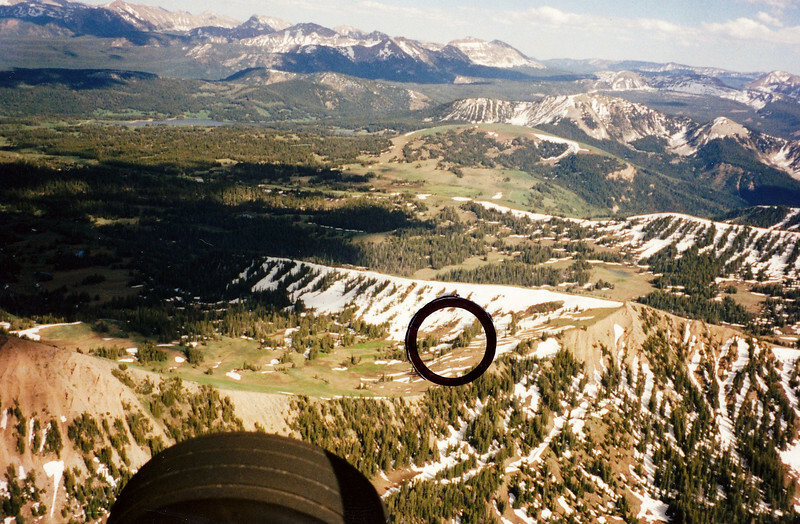 The correction would allow the flight to fly under the weather, but not above the hazardous mountainous terrain. The flight, cruising at 10,000 feet, communicated with radio operators at both Knight, Wyoming and Salt Lake which relayed to the flight the deteriorating weather conditions and expected time of arrivals over various positions along the route. At 8:19 PM, United Trip One acknowledged a weather report from Salt Lake. At 9:05 PM, The controllers at Salt Lake made several repeated calls to United Trip One, but there was no response from flight. 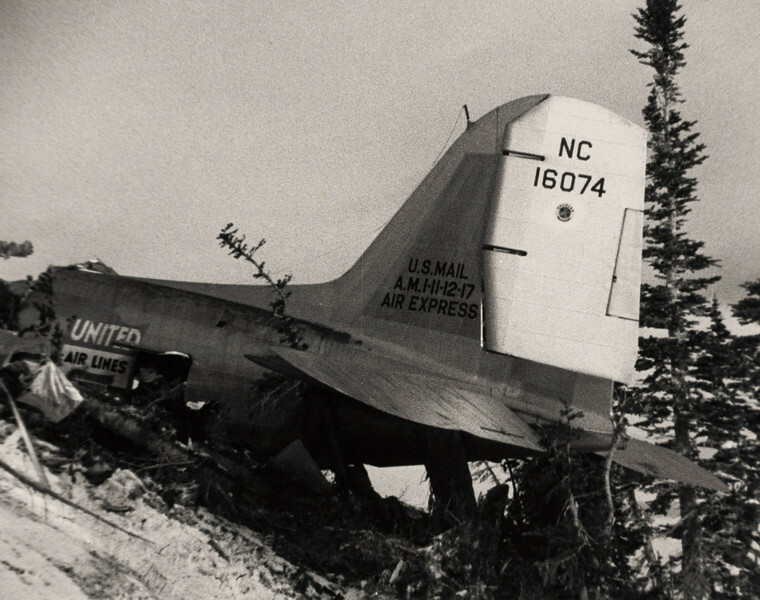 The subsequent accident investigation revealed that United Trip One had strayed south of the intended course by 20 miles and into the east slope of 10,300 foot Humpy Ridge. All on-board were killed on impact. The cause of the flight's deviation was most likely the result of snow static phenomenon and an un-forecasted shift in wind. Before driving out and hiking to the site, I had the opportunity to fly over the site during 1996 and match an old photo from 1937 with the crash site location. 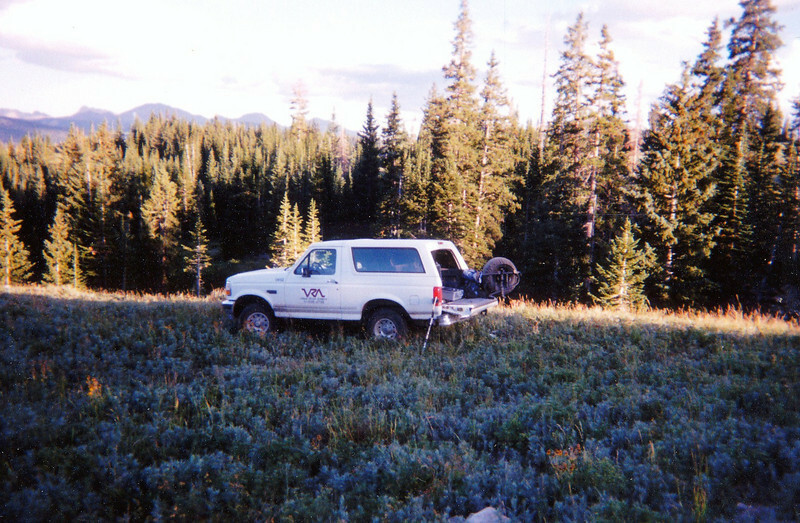 On August 31, 1997 I began my hike to the GPS coordinates I determined to be the location of the impact site. The crash site is located in a very remote region, so I was surprised to find very little wreckage remaining at the site. 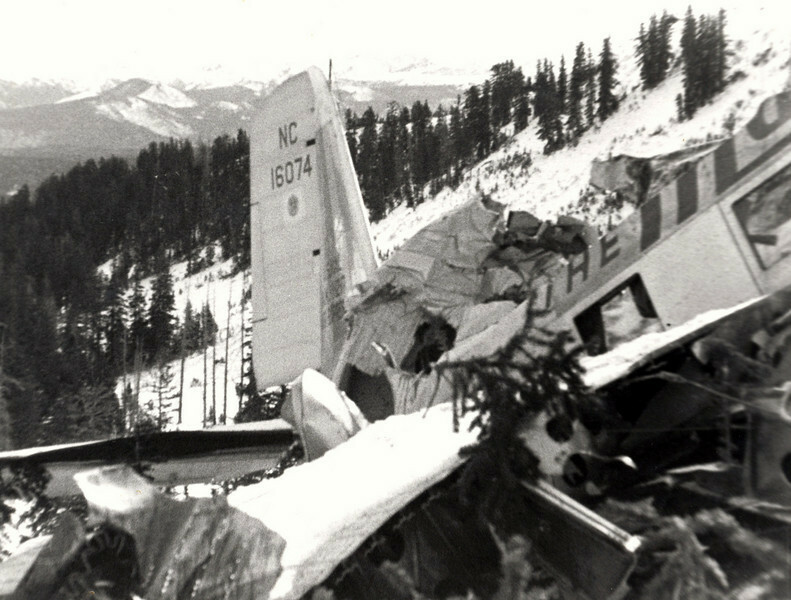 The wreckage at the site consisted of small metal fragments, glass from the passenger windows, and broken dishware china from the aircraft galley. A partially buried fragment caught my eye at the impact point. It was piece of cast metal from the engine case. Undamaged and in like new condition the enameled eagle of the Pratt and Whitney engine logo. 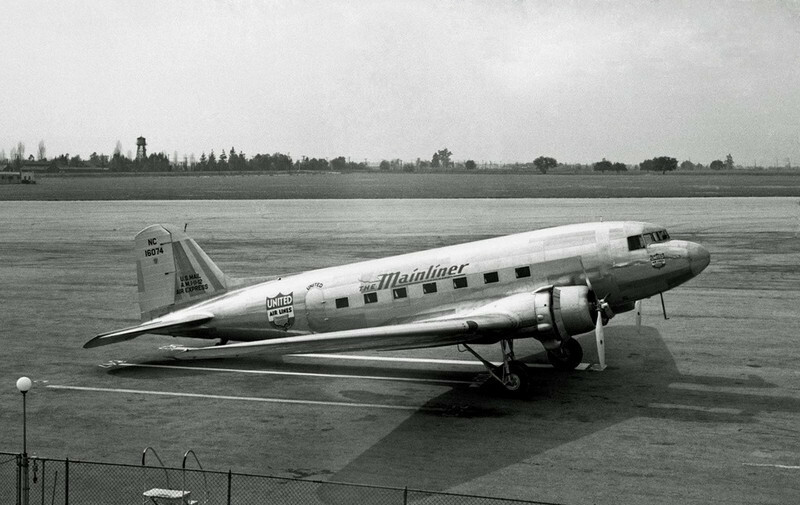 The airplane, a Douglas DC-3A (NC16074), was owned and operated by the United Air Lines Transport Corporation of Chicago, Illinois. It was inspected and approved for license by the Department of Commerce on December 8, 1936. Ship #74 operating as Trip One, departed Cheyenne at 6:26 PM (25 minutes late due to passenger delays). At the time of departure from Cheyenne, there was 622 gallons of fuel on board and 200 quarts of oil, an amount sufficient for approximately seven hours of flight at normal cruising speed. 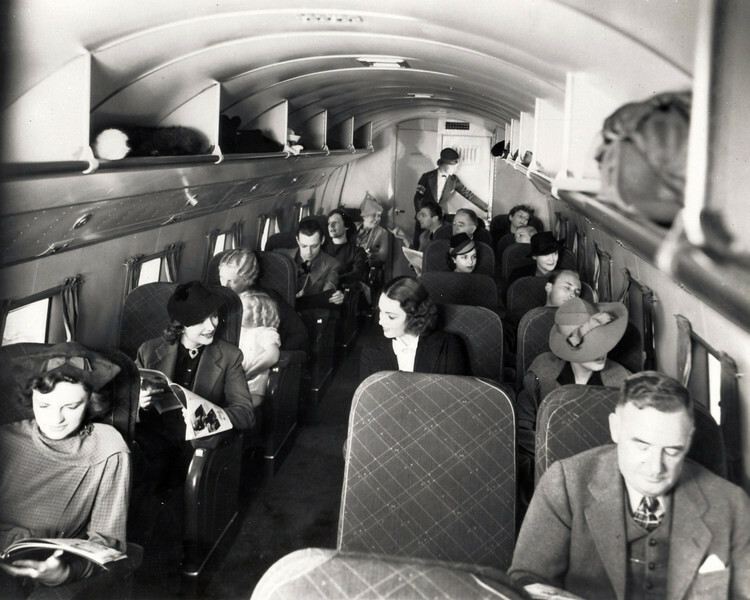 Compared to Boeing's model 247 airliner of the time, the passenger cabin of the Douglas DC-3 was very spacious. 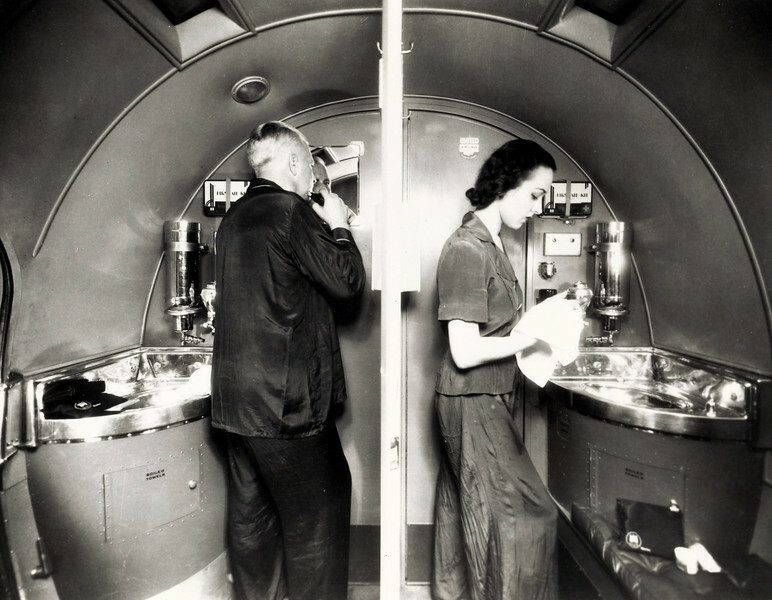 Seperate aft cabin lavatories for men and women were common on all United Mainliner DC-3's. 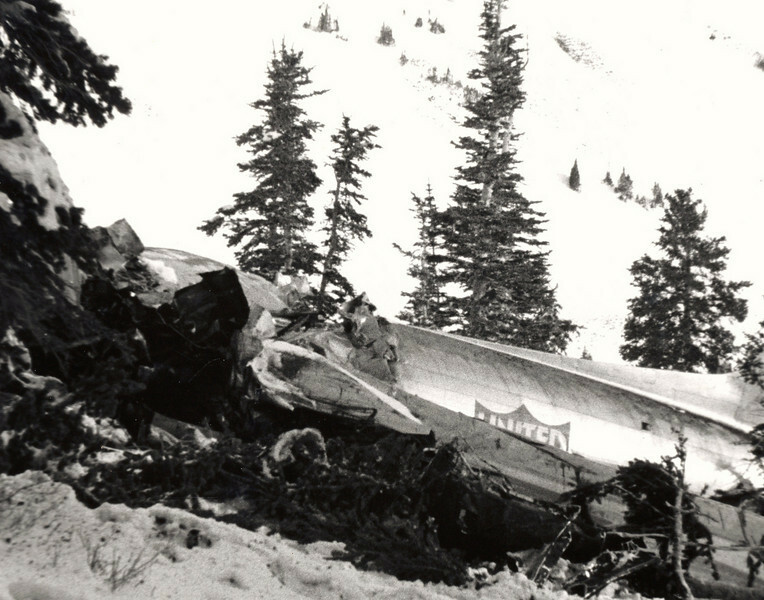 After treking nearly three days on foot and horseback through deep snow, rescuers found this scene of the once proud Ship #74. 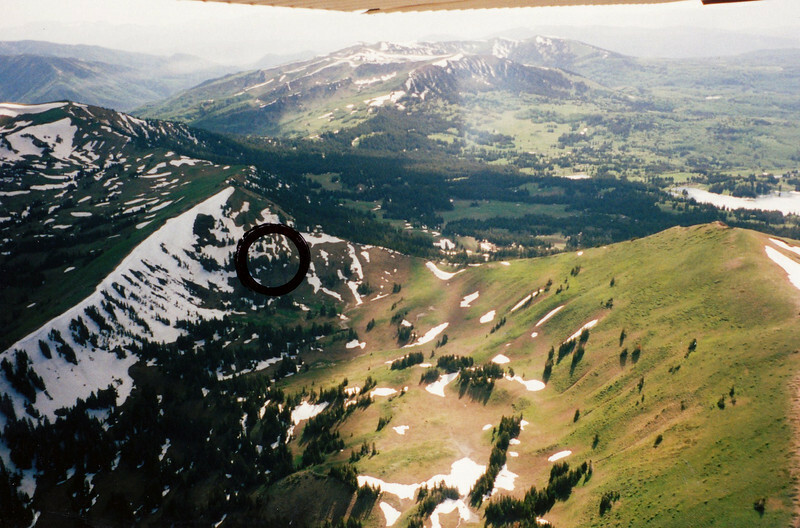 The plane flew straight into the east slope of Humpy Ridge at cruise speed. With a fatal combination of darkness and bad weather, it's likely that neither pilot seen the approaching terrain. A group of local ranchers and cowboys from nearby Knight, Wyoming help collect the victims and their personal effects. The sloping terrain and deep snow made for a sudden violent stop and a small debris field. 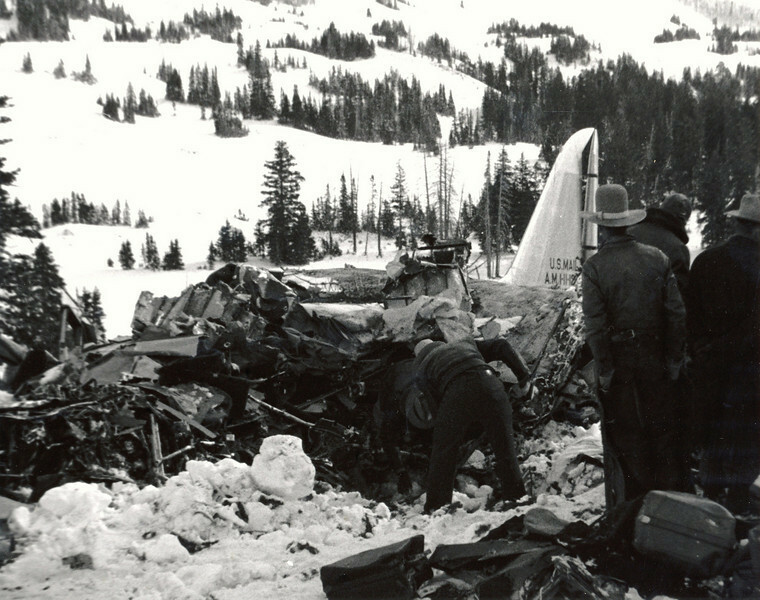 The DC-3's engines were torn from their mounts and thrown over 150' from the main impact site. 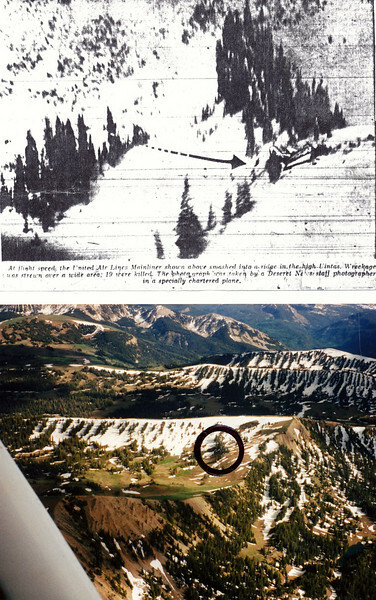 Utilizing a set of aerial photos taken of the crash site in 1937, I was able to locate the crash site by the use of photographic comparison. Nearly 60 years had passed, but the area had changed very little over time. Exsisting tree lines that were present in 1937 were used to pinpoint the present day accident site. 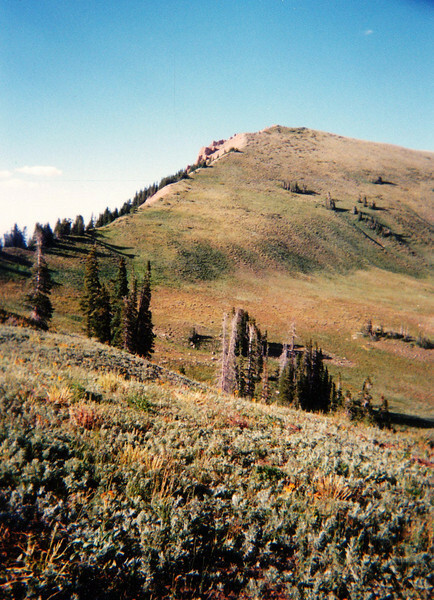 Humpy Ridge is not a jagged steep mountain, but rather has a gradual steady sloping topography which would have made seeing the impending danger difficult. 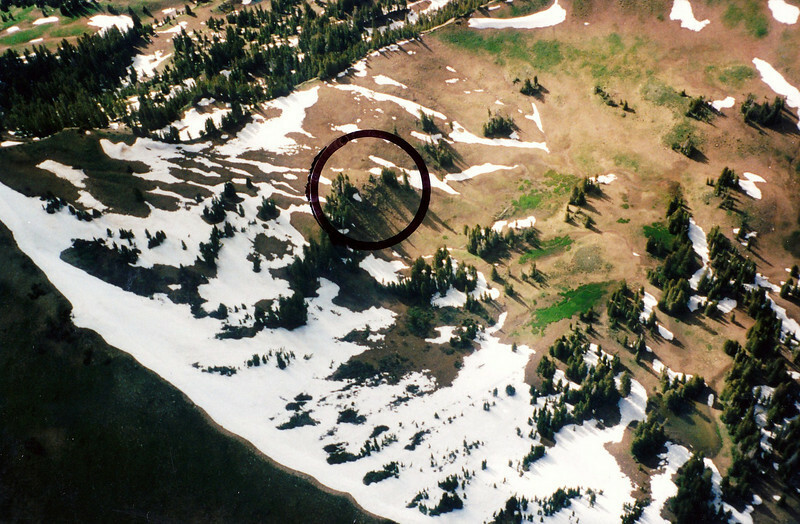 This aerial photo taken in late June illustrates the amount of snow that remains on 10,000 foot Humpy Ridge. 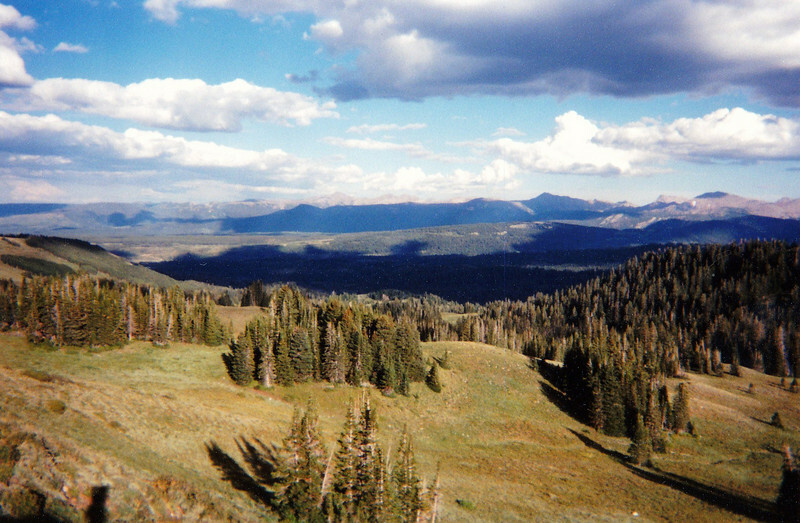 At these upper elevations, there is a small window of opportunity for a hike in. 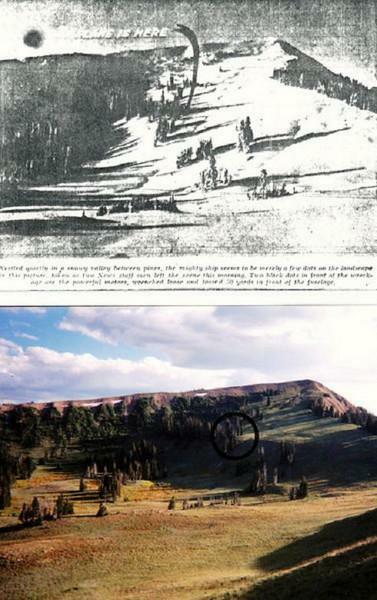 I was able to match a surface photo taken of the site in 1937. 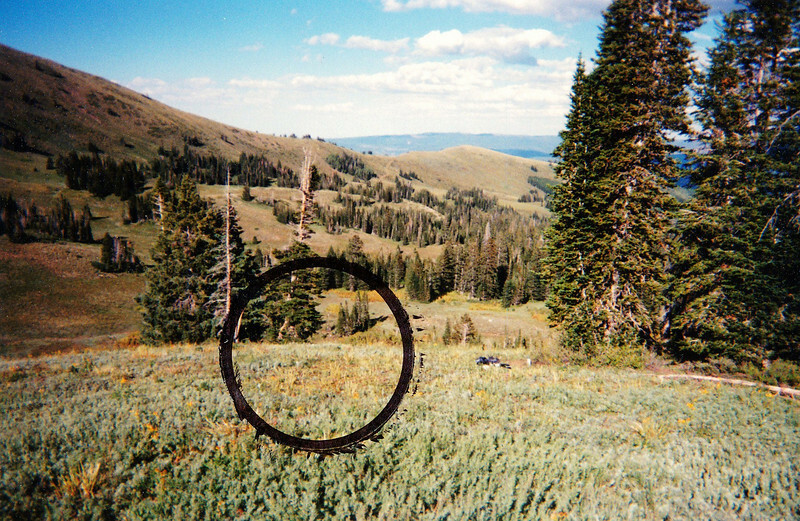 Probably the biggest danger of visiting this remote crash site in late August was the possibility of a bear attack. Visiting this site gave me the opportunity to use my new Magellan hand-held Global Positioning System (GPS). 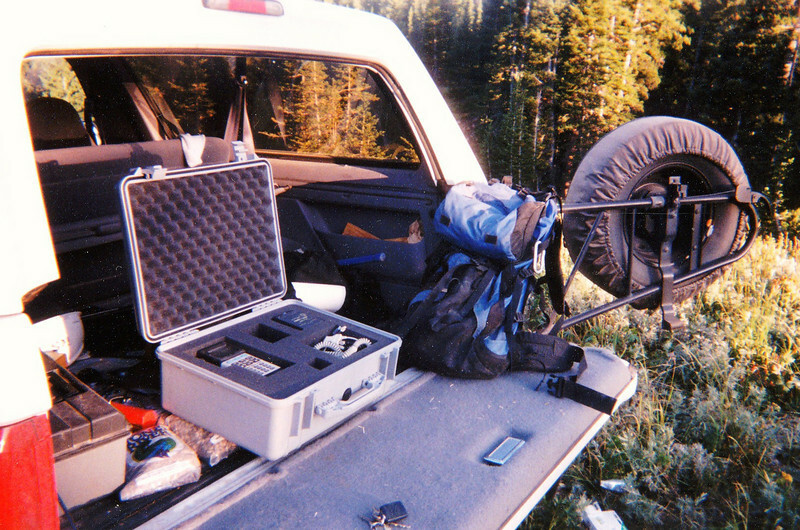 Compared to current portable GPS systems, the system I used on my 1997 visit is considered a "dinosaur" by today's standards. Looking north across the crash site and Humpy Ridge. United Air Lines "Trip One" flew up this gradual sloping terrain during a stormy night flight to Salt Lake City. The circle depicts the location of the main impact point of United "Trip One".